Take advantage of the Workable Benchmark: accessible recruiting data that makes it easy to measure and improve your hiring process. The Workable Benchmark combines anonymized hiring and recruiting data from over 6,000 active Workable customers. This data is a valuable, up-to-date and global source to benchmark your recruitment metrics. Select a region and industry below. See how your region compares to the global average for your industry. Use this to benchmark your recruiting data and highlight areas for improvement. Use the Workable recruiting center to analyze your own recruiting process. 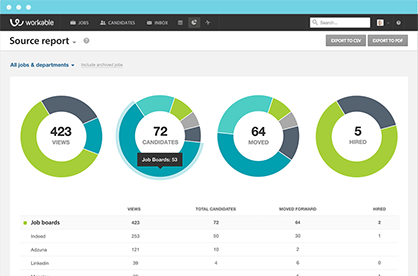 Workable has a full reporting suite, including Candidate Source Reports, Pipeline Reports, Time to hire and Productivity reports.